8,000 homes across 13 neighbourhoods were selected to participate in the Edmonton Cart Rollout which begins on Monday April 15, 2019. In March, participants received a letter in the mail letting them know that they have been chosen. Under the new cart-based system, each of the participating neighbourhoods will have a new collection schedule. Your green cart will be picked up every week, switching to every 2 weeks during winter. Your blue bags will be picked up every week. Your black cart will be picked up every 2 weeks as most of your waste will now go into your green cart or blue bags. Additional yard waste will be picked up on special, seasonal collection days, twice in the spring and twice in the fall. This new system encourages sorting of household waste and supports overall waste reduction. This will help minimize the amount of garbage sent to landfill and build a more sustainable future for Edmonton. 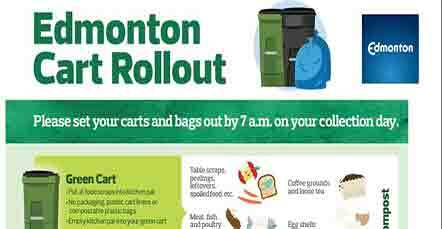 The Edmonton Cart Rollout will help inform the 25-year waste strategy for Edmonton. This strategy will be proposed to Utility Committee and City Council in 2019 for their review and approval. Keep the Good News Rolling! 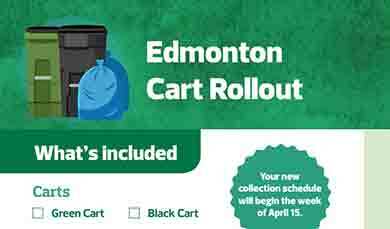 Everything you need to know about the Edmonton Cart Rollout! Type in a waste item and learn where it goes! If you received a letter that you will be participating in the rollout, see the calendars below for your new schedule. Which neighborhoods are selected to be part of the rollout? The Edmonton Cart Rollout includes the following 13 neighbourhoods: Baturyn, Beacon Heights, Brintnell, CY Becker, Chambery, Delwood, Ellerslie, Forest Heights, Kensington, Kiniski Gardens, Miller, Satoo and Tamarack. Please note: There is a chance that even if you live in one of these neighbourhoods, your home may not have been selected for the rollout at this time. Homes were selected based on routes within the mentioned neighbourhoods that could be serviced with specific automated collection vehicles. Why was my home selected (or not selected)? Neighbourhood selection was based on a variety of factors to ensure a representative sample of Edmontonians. The routes selected were based on a number of factors such as neighbourhood design, mix of front and back alley collection routes, and collection dates. The selected neighbourhoods provide a reflection of the city as a whole. Why are there gaps in the neighborhoods between the selected homes? Selecting all houses in a single consecutive area would not have provided the diversity of the selected group in terms of: neighbourhood design, mix of front and back alley collection routes, and collection dates. My home wasn’t selected, can I still participate? Unfortunately no. The neighbourhoods in the initial rollout were selected according to be a representative sample, and collections will be conducted by automated collection vehicles along planned routes. It is not efficient to run routes based upon a voluntary system. Will there be a fee increase with this new rollout? No, the utility fee will remain the same. All carts and support for the program will be provided and supported with the existing utility budget. Are there penalties for setting out my carts incorrectly? No, not at this time. However, improper set out means that the automated collection vehicle will not be able to pick up the cart. If you are having difficulty getting your waste to the curb or lane or if your waste was not picked up, please call 780-496-5678 (Waste Hotline) to get help with proper set out instructions and pick up. If my current collection is from the back alley but the carts were delivered in the front, will my carts be collected from the front street? If your current collection is from the back alley, your carts will also be collected from the back alley. We are not contemplating changes to this in the near term. What if my cart is damaged? If your cart is damaged or missing, please contact the Waste Hotline at 780-496-5678. What if my cart goes missing? Each cart is equipped with a unique barcode associated with the address it was delivered to. Please report lost or found carts to Waste Hotline (780-496-5678). The situation will be investigated and carts replaced as needed. How should I clean my cart? Cart cleanliness is the responsibility of the resident. If your carts need cleaning, rinse your cart with a hose and pour the water on the grass or gravel, being careful that the dirty water does not enter the storm drain. If material gets stuck inside the cart, use a broom or shovel handle to loosen it. To clean your kitchen pail, rinse it with hot water or place it inside your dishwasher. To ensure food waste does not become lodged or frozen to the base of the cart, you can place crumpled up newspaper at the base of your green cart. How do I clean my kitchen pail and keep my green cart from getting smelly? To clean your kitchen pail, rinse it with hot water or place it inside your dishwasher. You can mix one-part vinegar and three-parts boiling water as this helps clean the surface and removes the fly-attracting odours. In addition, you should ensure that your green cart remains fully closed at all times. To reduce odours, we recommend you store your cart in a shady spot, out of direct sunlight. To ensure food waste does not become lodged or frozen to the base of the cart, you can place crumpled up newspaper at the base of your green cart. If your carts need cleaning you may rinse your cart with a hose and pour the water on the grass or gravel, being careful that the dirty water does not enter the storm drain. If material gets stuck inside the cart, you may use a broom or shovel handle to loosen it. To clean your kitchen pail, rinse it with hot water or place it inside your dishwasher. Can I use a liner in my green cart or kitchen pail? We encourage residents to not use a liner in their green cart or kitchen pail. If a liner is desired, the liner should be paper (preferably newspaper, paper towel, a paper bag or shredded paper). No plastic of any kind including plastic bags or compostable bags are allowed in the green cart. Can I use compostable bags? Compostable or biodegradable bags are not accepted in the green cart as the requirements for breaking down these products which are marketed as "certified compostable products" are very specific and require exposure to extreme temperatures for an extended period of time. Since these requirements are difficult to meet, the remains of these bags would compromise the quality of the final compost product and therefore cannot be accepted. Can I throw in shredded paper, paper towels, newspaper, tissues (Kleenex), and wood waste (popsicle sticks) in the green cart? It is recommended to put shredded paper, tissues, paper towels and wood waste, such as popsicle sticks, in your black cart. Newspaper and paper inserts can go in the blue bags recycling. Small amounts of newspaper or shredded paper can be used in the green cart as a liner.